The Dow Jones Industrial Average today (Wednesday) surged 247 points following the release of minutes from the October 2015 FOMC meeting. The U.S. Federal Reserve's minutes suggested many of its officials are encouraging an interest rate hike in December, despite concerns about the nation's long-term economic potential. CME FedWatch suggests there is a 67.8% chance the central bank will raise interest rates at its next meeting on monetary policy. 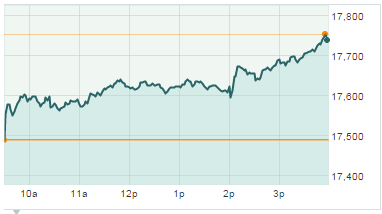 The Dow Jones received its biggest boost from Apple Inc. (Nasdaq: AAPL). Shares of the tech giant surged 3.2% on news the company joined Goldman Sachs Group Inc.'s (NYSE: GS) Conviction Buy List with a price target set at $163 per share. That represents a 40% premium from yesterday's closing price. Goldman says it believes Apple will center its focus in 2016 on growth in the tech sector. However, beware Goldman's Conviction Buy List. Even though Money Morning expects Apple stock to hit $200, here's why we do not trust this "Golden" list, and neither should you. Stock Market News: All 10 S&P sectors saw gains today, with healthcare and basic material stocks leading the way. Basic materials were up 2% thanks in part to ongoing merger and acquisition activity in the sector. This morning, Airgas Inc. (NYSE: ARG) hit a 52-week high after the company agreed to be bought by France's Air Liquide SA in a $13.4 billion deal. Here's a breakdown of this deal, which could send another U.S. company abroad. Oil in Focus: Oil prices rose after falling below $40 per barrel for the first time since August. Concerns about a global glut continue to keep prices subdued. December WTI prices temporarily slipped below $40 per barrel before finishing up 0.4% at $40.84 per barrel. Meanwhile, Brent oil crude – priced in London – added 1.7% to hit $43.65. High-volume stocks Exxon Mobil Corp. (NYSE: XOM) and Chevron Corp. (NYSE: CVX) added 1% and 1.3% on the day, respectively. Domestic crude inventories increased last week, albeit below the build forecast among analysts. According to the U.S. Energy Information Administration, U.S. crude inventories increased by 252,000 barrels compared to the expected increase of 1.9 million barrels. The United States now has a stockpile of 487.3 million barrels, according to government statistics. On Tap Tomorrow: On Thursday, keep an eye on the weekly jobless claims report, an update to the Philadelphia Fed Business Outlook, and speeches from two members of the Federal Reserve. Companies reporting quarterly earnings tomorrow include Gap Inc. (NYSE: GPS), Best Buy Co. Inc. (NYSE: BBY), Intuit Inc. (Nasdaq: INTU), Splunk Inc. (Nasdaq: SPLK), Workday Inc. (NYSE: WDAY), and The Fresh Market Inc. (Nasdaq: TFM). Stocks to Watch No. 1, CAG: Shares of food giant ConAgra Foods Inc. (NYSE: CAG) gained nearly 4% on the day after announcing plans to spin off its frozen potato products division. The new public company, which is part of a large restructuring project, will be called Lamb Weston. Stocks to Watch No. 2, GOOGL: Shares of Alphabet Inc. (Nasdaq: GOOG, GOOGL) were up more than 1.8% on a wealth of news involving the company's business goals. First, the firm announced it has re-launched its social networking service Google Plus after giving the once-failed project an overhaul. Alphabet also announced plans to partner with Facebook Inc. (Nasdaq: FB) on a program designed to increase mobile search capabilities. Finally, the firm said it plans to launch a new screen-less version of Google Glass wearable technology. Stocks to Watch No. 3, TGT: Shares of Target Corp. (NYSE: TGT) fell more than 4.2% despite news the retailer beat top- and bottom-line earnings expectations and raised forward guidance. Stocks to Watch No. 4, AMZN: Shares of Amazon.com Inc. (Nasdaq: AMZN) added another 3.2% on the day on news that Martha Stewart has taken her venture "American Made" to the e-commerce retailer and abandoned her work with eBay Inc. (Nasdaq: EBAY). The news is a blow to eBay stock, which fell after hours, and Etsy Inc. (Nasdaq: ETSY), which dipped 1% on the day, as Amazon builds a larger "handmade" marketplace with a much better logistics network.